When we launched the Arc platform in 2014, our goal was to create a platform that allows gamers to find the best free-to-play games. That vision still holds true and we are launching Arc Quests this week to give you more opportunity to discover games, be rewarded for playing, and for follow the latest updates for games on the Arc platform. 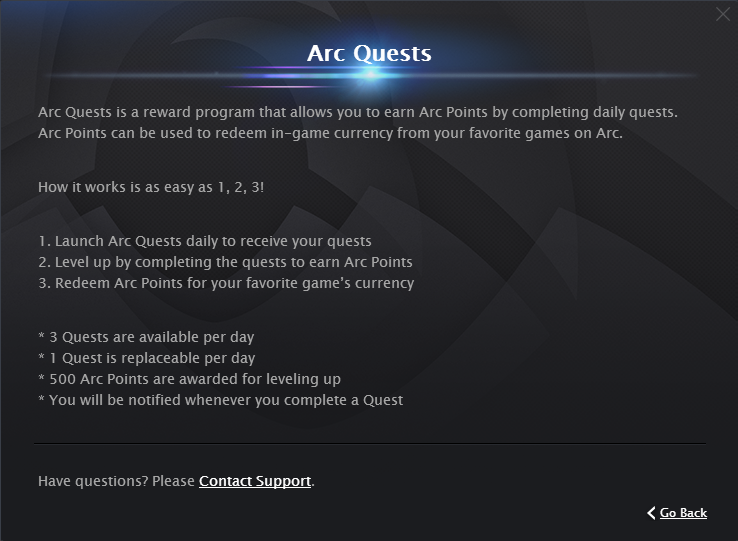 When you log into the Arc client, you will be presented with an option to view your daily quests by clicking the Arc Quests button on the bottom of the client. Each day, a fresh new set of quests will be available for you to complete. These can be anything from playing a game for a certain amount of days to visiting the blogs, Twitter and Facebook pages for one of the games on the Arc platform. If you aren’t planning on finishing one of the quests, you can replace one quest immediately per day by canceling the quest on the top-right of the quest card. Completing quests will give you experience points to level up your Arc Quests level. 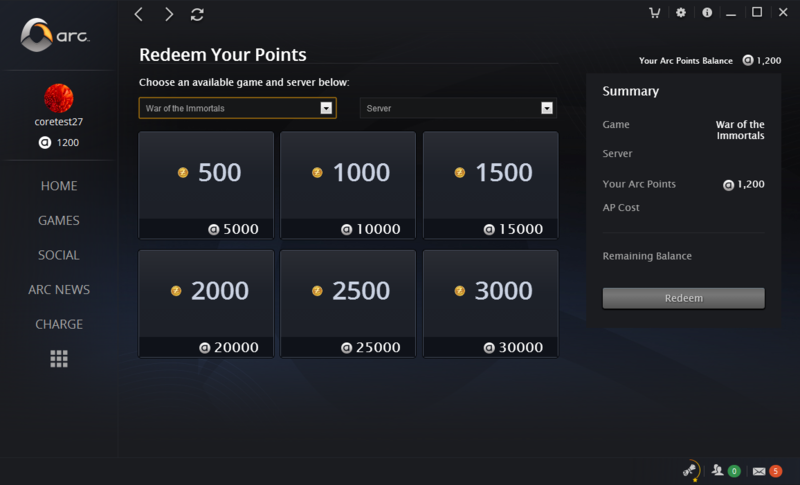 Each level requires 600 XP and will reward you with 500 Arc Points that can be transitioned into ZEN or other in-game currencies available for games on the Arc platform. There is no level cap to your Arc profile, so you will continue to receive rewards as you complete your quests. 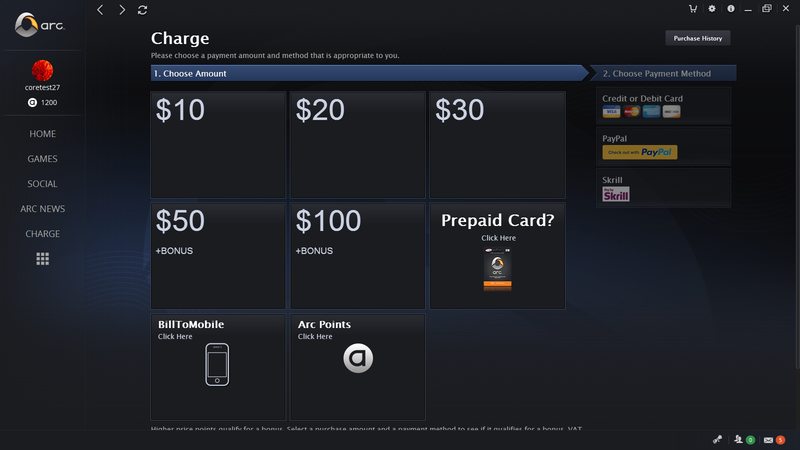 These points will be redeemable via the Charge tab on the Arc website and client. 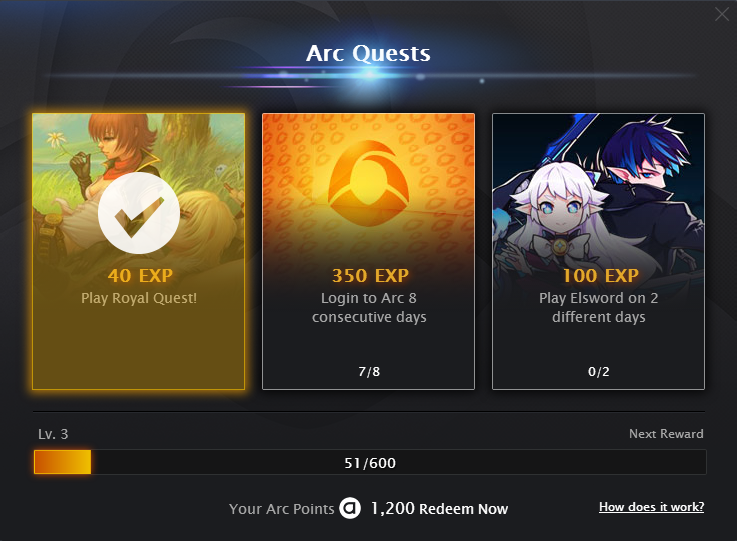 As new games and content launch on the Arc platform, we will introduce new Arc Quests, giving you the opportunity to discover even more games on the Arc platform. Similar to all adjustments that we are making with Arc 3.0, we are going to be monitoring feedback from our players. If you have questions or comments, feel free to add them on to our announcement forum thread.